A NEW RIDE — Highland High School freshman Joseph Kercado received a new skateboard Monday, courtesy of professional skateboarder Manny Santiago, to replace the one he had to leave behind when his family moved here from Puerto Rico following Hurricane Maria. 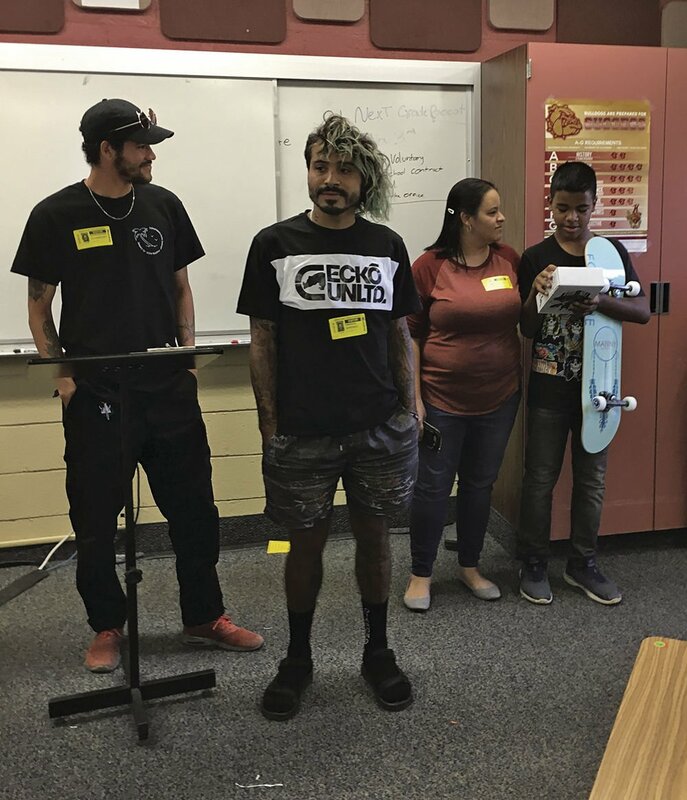 A FEW WORDS — Professional skateboarder Manny Santiago, second from left, speaks to Daniela Palacio Salazar’s English class at Highland High School, joined by Cesar Velez, left. The pair presented freshman Joseph Kercado, far right, with a new skateboard to replace the one he left behind when his family moved here from Puerto Rico following Hurricane Maria last year. Joseph’s mother, Jennifer Vargas was on hand for the surprise. PALMDALE — Joseph Kercado can be a full-fledged skater once again, thanks to the thought­fulness of his teacher and the generosity of a professional skateboarder. Joseph, a freshman at Highland High School, received a brand new skate board Monday to replace the one he left behind when his family moved here from Puerto Rico a year ago, in the aftermath of Hurricane Maria. 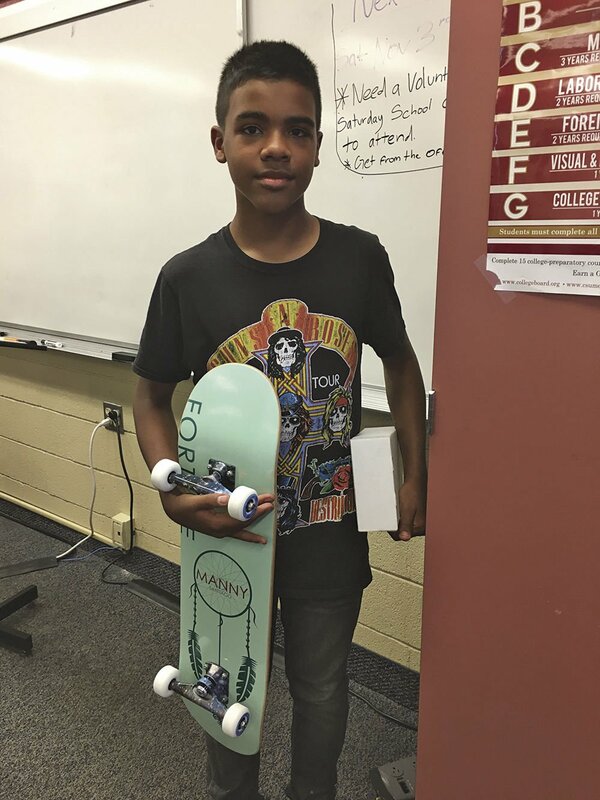 The skate board was hand-delivered by pro­fes­sional skater Manny San­ti­ago, who is also from Puer­to Rico, during Jo­seph’s English class Monday. “It’s pretty nice. I don’t know what to say,” Joseph said after receiving the surprise visit. The story began with En­glish teacher Daniela Pal­acio Salazar, who start­ed at the school just two weeks ago. As a means of getting to know her stu­dents, Salazar had them write letters to her. Jo­seph’s letter stood out with his description of himself. He wrote, “I am a skater, but not any more because I had to leave my skateboard behind,” Salazar said. Because her husband has worked in a skate shop for a long time, she asked him if he could help get a skate board for Joseph, thinking there may be a used one available. Instead, he contacted Cesar Velez, who in turn con­­nected him with San­ti­ago. The professional skate­boarder, who lives in Los Angeles, decided to bring a brand-new board from his own line and hand-deliver it, along with some stickers and other swag from one of his spon­sors. Santiago also used the visit to the high school as a chance to connect with the other students, and to dem­onstrate what it’s like to help others when you can. Santiago spoke to the class about the importance of having dreams and working hard to achieve them, and to take advantage of the help of teachers like Salazar to guide them along the way. “You have an open net­work of people here who care for you and want the best for you,” he said. He talked about his own ex­periences, including a re­gret that he didn’t pay more attention in school, and how he was able through hard work and ma­king the right choices to achieve his own dreams. Joseph’s mother, along with his teacher and school administrators, was in on the surprise visit and came to campus to take part. The move a year ago “was a rough time,” she said, but people have been extremely nice and have helped them along the way. The family came to the Antelope Valley, where Vargas has family, after they learned they would no longer be able to rent the house they where they lived in Puerto Rico. When the family first moved to Palmdale in November of last year, Joseph enrolled at Hillview Middle School, and started at Highland this fall as a freshman. Vargas knew Joseph, the oldest of three children, had left things behind, but did not realize how much the absent skateboard meant until she heard from his teacher, she said. “That was incredible,” she said Monday. Joseph has been skating since he was about nine years old, when his mom gave him his first skateboard. Santiago is host to a free skateboard contest each year in Puerto Rico to provide a chance for skaters there to show their stuff and maybe get no­ticed, and looks for other op­por­tunities to reach out to youth. With the new con­nection to Highland High School, he hopes to extend his outreach here with activities in cooperation with the school. He hopes his efforts inspire other skateboarders to lead by example, “to be a role model for kids they wish they had,” he said. Highland Principal Chris Grado praised Sal­azar and Santiago for the extra-curricular effort to help a student. The high school district works to ensure students are plugged into activities, whether it be sports or band or skateboarding, as each has its own culture of community that can offer students support, he said. Something like this is a great opportunity to show students there are other people out there to offer help and to help keep students from feeling isolated. Excellent great to see,...I hope he has a helmet, and elbow guards, also.